Mmm.. guacamole. 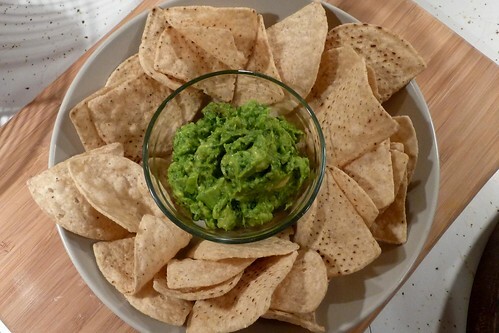 Surprisingly easy to make and oh-so-good with chips or on sandwiches (and many other places), it’s worth the 5 minutes when avocados are a reasonable price. In my small town, it’s nearly impossible to get avocados at a good price; groceries usually sell them for exorbitant amounts ($3 for a medium avocado?!) so when I need some, I go down to the Mexican grocery which has them all the time for less than a dollar. They’re always ripe (or overripe) and it’s best to get there early when their produce shipments come in, but it’s worth the trouble to pick through. Don’t know how to pick an avocado? I’m used to the Hass variety which makes up 85% of the US avocado market and 80% of the world avocado market. When unripe, the fruit will feel very hard and the skin will be green. As it ripens, the skin blackens and the fruit softens. If you want to eat it that day: Look for an all-black avocado that yields to gentle pressure. If it squishes very easily, it’s overripe and may be rancid (ick). If you want to eat it in a few days: Look for a mostly-black avocado that isn’t quite rock-hard. Leave it on the counter to ripen, but if you leave it near bananas or apples, it will ripen faster (due to the effects of ethylene gas given off by these fruits). If you have a ripe or nearly ripe avocado that you need to use in the next day (but not today): put it in the fridge. Chilling it slows the ripening process and you can eke another 2 days out of a ripe avocado. Like apples and potatoes, avocado meat will turn brown once exposed to air. You can retard this process by brushing the meat with acid, usually from a lime or lemon, and covering it well with plastic wrap or cellophane. One last note… All parts of avocados are toxic to pets, including cats, dogs and birds. Don’t share your guac with them, okay? Don’t give the pit to your parrot as a chew toy or let your dog clean out the bowl. 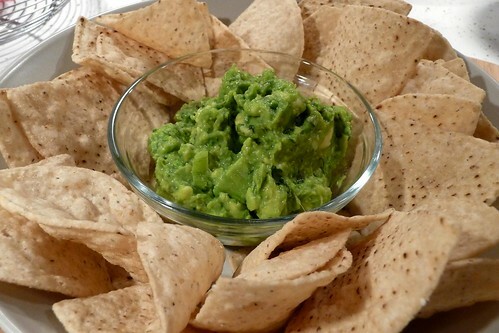 Share your chips if you like, but keep the guac to yourself. Grate lime zest and juice lime. Combine zest, garlic, onion, chile and salt in a small bowl. Add cilantro and mix in thoroughly. Scoop avocado meat into the bowl, mash together with mixture using a fork or potato masher, leaving a few chunks of avocado. Add lime juice and taste, add salt as needed. Serve immediately. Individual chile peppers can vary widely on heat, even within a species. I’ve had incredibly mild jalapenos and fiery hot jalapenos — I’ve found the spiciest tend to be locally grown and mild tend to come from stores. But that’s me. No peppers? Try using some chile powder or cayenne. Roasted peppers can also be very nice – try roasting an anaheim or poblano or pasilla pepper. How? Put it in the oven (or grill) and broil for 10 minutes (turning periodically) until the skin is blackened and blistered, remove to a paper sack for 10 minutes, then once it’s cool enough to handle, peel off the papery skin, remove the seeds and mince the meat finely. This entry was posted in dairy-free, gluten-free, mexican, recipes, side, untranslated, vegetable, vegetarian. Bookmark the permalink.